Twelve Boy Scout from Troop No. 33 of DeKalb, Ill., and six adult leaders took to Lac Vieux Desert for an ice-fishing trip Jan. 18. 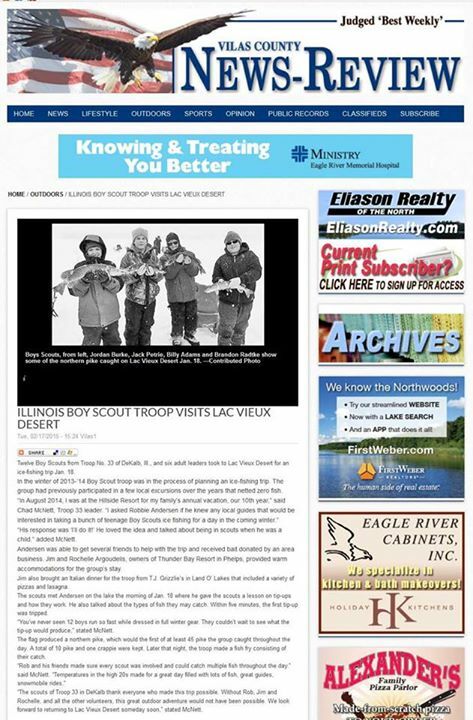 In the winter of 2013-’14 Boy Scout troop was in the process of planning an ice-fishing trip. The group had previously participated in a few local excursions over the years that netted zero fish. “In august 2014, I was at the Hillside Resort for my family’s annual vacation, our 10th year.” Said Chad McNett, Troop 33 leader. “I asked Robbie Andersen if he knew any local guides that would be interested in taking a bunch of teenage Boy Scouts ice fishing for a day in the coming winter”. “His response was ‘I’ll do it!’ He loved the idea and talked about being in Scouts when he was a child,” added McNett. Andersen was able to get several friends to help with the trip and received bait donated by an area business. Jim and Rochelle Agoudelis, overs of Thunder Bay Resort in Phelps, provided warm accommodations for the group’s stay. Jim also brought an Italian dinner for the troop from T.J. Grizzlie’s in Land O’ Lakes that included a variety of pizzas and lasagna. The Scouts met Andersen on the lake the morning of Jan. 18 where he gave the Scouts a lesson on tip-ups and how they work. He also talked about the types of fish they may catch. Within five minutes, the first tip-up was tripped. "You’ve never seen 12 boys run so fast while dressed in full winter gear. They couldn’t wait to see what the tip-up would produce,” stated McNett. The flag produced a northern pike, which would be the first of at least 45 pike the group caught throughout the day. A total of 10 pike and one crappie were kept. Later that night, the troop made a fish fry consisting of their catch. “The Scouts of Troop 33 in DeKalb thank everyone who made this trip possible. Without Rob, Jim and Rochelle, and all the other volunteers, this great outdoor adventure would not have been possible. We look forward to returning to Lac Vieux Desert someday soon,” stated McNett.